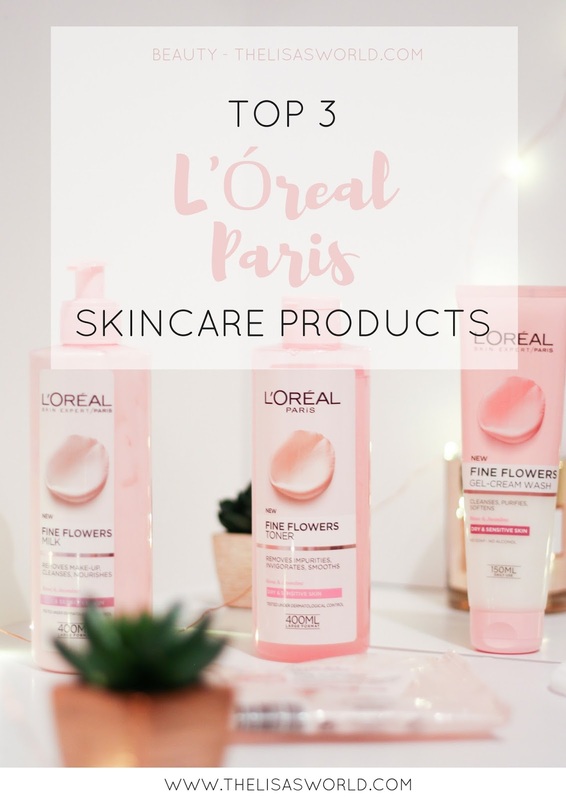 It won’t be the first time that I say here on the blog that L’Óreal Paris is one of my favourite drugstore brands not only for makeup products but also skin care. Every time there is something new in their collection, I am always very eager to try. I have very dry skin and I always try anything that can make it better so when they came up with this range last year, I got my hands on it and never looked back. I don’t know how many times I have repurchased these little things and I love them so much that I even bought extra and took them to Portugal to have it all in stock when I go back home on holidays (things are much cheaper here). The Fine Flower range is available for either dry and sensitive skin or to normal and combination skin and has the aim to gently remove makeup and leaving you with soft skin with the help of rose and jasmine flower extracts. 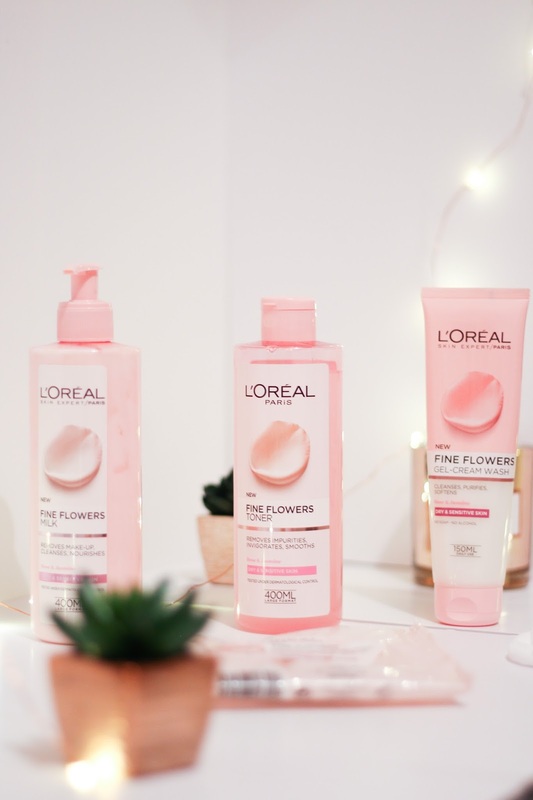 First, as a face wash, I use the L’Óreal Paris Fine Flowers Gel-Cream Wash. Ideal to wash your face in the morning and evening, helping you get rid of any impurities or left over makeup. I love how fresh my skin feels after using this product. I normally use wipes as a first step to remove most of my makeup. 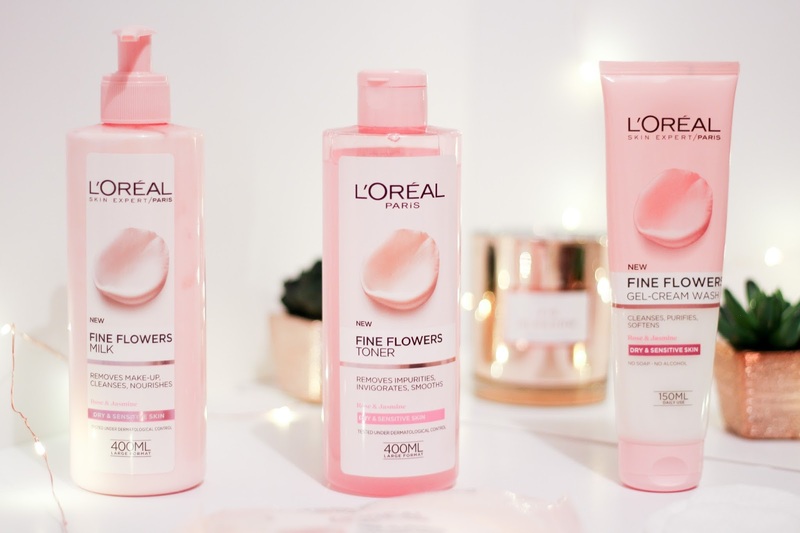 This range also has some amazing ones, the L’Óreal Paris Fine Flowers Cleansing Wipes, so I grab one of them and try and remove some of my makeup. Then, to go deeper and cleanse my skin properly removing any existing makeup, I use the L’Óreal Paris Fine Flowers Cleansing Milk. I use a few pumps of this either on my hands or a cotton pad and rub it on my skin using circular motions. Then, I just wash it off with some nice warm water. It feels so good to get rid of that makeup that has been sitting on your face all day! As a final step, I go with the L’Óreal Paris Fine Flower Toner using a few drops of this on a cotton pad and gently applying it on my skin. This is like a breath of fresh hair and makes you skin fell so clean, nourished and hydrated. It is my favourite step of them all. Although these products have flower extracts, the sense isn’t too strong. I actually adore the smell and how fresh it makes my skin feel. I know that these products will be staying for a while as I have noticed a good difference on my skin since I have started using it and how my skin goes crazy if I skip this routine any day(s). 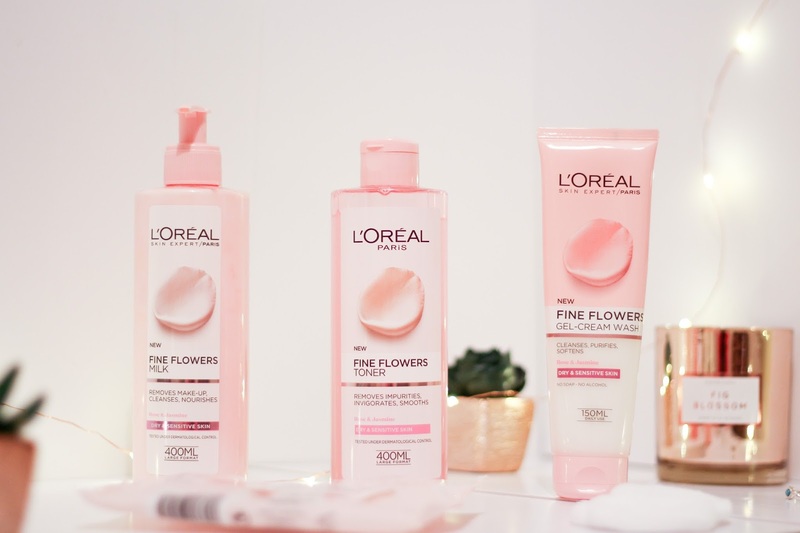 The L’Óreal Fine Flower range smooths, nourishes and hydrates my dry skin and the best thing of sticking to these products is not only they are very affordable for the great results you get but also having a beautiful, smooth and hydrated skin means that your makeup will sit much better and look flawless and that I have tested and confirmed!